While the oil sands produce a larger chunk of the Canada's greenhouse gases the pros outweigh the cons. Canada as a whole benefits and will benefit from jobs for up to 5.4 million Canadians by 2020. Imagine the housing needs then. Everyone knows that the oil sands' pros far outweigh the cons and would be foolish to say no to their significant contribution to Canada's economy. The Alberta government has taken A LOT of flak for the environment in Northern Alberta. Yet it seems to be doing so much to right the environment. Recently the province announced plans to more than triple the amount of protected land in the controversial northeast. 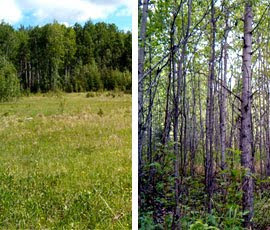 Forests rebuilt from reclaimed ground are soon to become a reality as researchers work to bring back the boreal forests. Check out how Faster Forests come into play here.